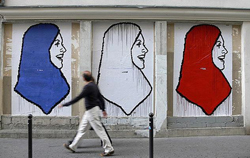 After Charlie Hebdo: French laïcité and Islam: Can the Republican Model hold? Event location: Willam and June Warren Hall is located on Amsterdam Avenue at 115th Street. Room L-107 is on the cellar level, down one flight from the entrance level. Panelists discuss the social integration of Muslims in contemporary France and the consequences of the current debates on secularism (laïcité) and the “Republican model” for islamophobia. Abdennour Bidar is a philosopher and author. A specialist of Islam, he came to public attention in France in the aftermath of the Charlie Hebdo shooting, when he wrote an "Open Letter to the Muslim World.” He directs the "Cultures of Islam" program on France Culture. (See his recent article in Le Monde entitled "L'absence de spirituel est le probleme, pas l'islam.") Patrick Simon is a Directeur de recherche at the Institut national d’études démographiques in Paris, and a researcher at the Centre d’études européennes at Sciences Po Paris. He is a Visiting Professor at CUNY Graduate Center for the 2015-2016 academic year. His research interests include immigration, discrimination, ethnic and racial studies, ethno-racial classification in statistics, and the social and ethnic division of space. His newest edited books are Fear, Anxiety, and National Identity: Immigration and Belonging in North America and Western Europe (edited with Nancy Foner, 2015) and Social Statistics and Ethnic diversity: Cross-National perspectives on classifications and identity politics (edited with Victor Piché and Amélie Gagnon, 2015). Ethan Katz is an Assistant Professor of History at the University of Cincinnati, and the author of The Burdens of Brotherhood: Jews and Muslims from North Africa to France (Harvard UP, 2015), a history of Jewish-Muslim relations in France since World War I. *Event Location: Columbia Law School, William and June Warren Hall, Room 107 (Basement), 1125 Amsterdam Avenue, New York, NY 10027, click HERE for more location information.